The Ebac CD30 Dehumidifier is a tough machine for tough jobs. With a water extraction capability of 17 pints per day at 80°F and 60% relative humidity, and up to 48 pints at saturation, this unit is suitable for smaller areas of up to 400 sq ft (manufacturer's recommendation). Capable of effective operation at low temperatures and constructed to endure rough conditions this unit is ideal for industrial applications and for home use in cold conditions or where durability is a main requirement. 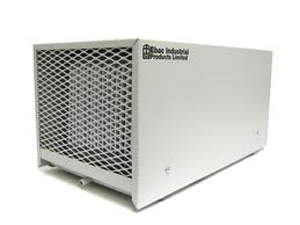 The Ebac CD30 Dehumidifier is designed and manufactured by Ebac, a company that began its dehumidifier business by producing units for industrial and commercial applications. This is an industrial dehumidifier and is designed for heavy duty use. It incorporates industrial quality fan, compressor, refrigeration coils and other components for high performance and low maintenance, mounted on a heavy duty steel chassis and finished in an epoxy coating for maximum durability. This unit is suitable for permanent installation at remote sites or for use at a number of different locations as the need arises. Weighing only 50lb and equipped with sturdy carrying handles this unit is portable and easily moved from one location to another in a small vehicle. The unit measures only 12" x 12" x 22" so is compact enough for easy transport and will fit easily into a small area for operation. While designed for industrial applications and clearly not a room dehumidifier, the Ebac CD30 is suitable for some domestic applications where its durability, low temperature operating capability and reliability would be of advantage. For smaller basements, and particularly crawlspaces, with low ambient temperatures, this unit has several advantages. It is as compact as any purpose-built crawlspace dehumidifier, can operate at lower temperatures than most and its low maintenance requirement and reliability are major advantages in inaccessible locations. This unit may also appeal to some boat owners who need a dependable dehumidifier for use while their craft is not in service. The key to the low temperature operation capability of the Ebac CD30 dehumidifier is its hot gas defrost feature. Although many users and potential users of dehumidifiers are aware that dehumidifiers can suffer from ice formation in the unit some are not and make less suitable choices as a result. Water is extracted from the air in these units by being passed over refrigeration coils and, because these are very cool, ice will form on them at ambient temperatures as high as 65°F. When the ice forms the dehumidifier stops extracting water until the ice melts and the performance of the unit is degraded. Hot gas defrost actively melts the ice by passing warm air over the coils so that the delay in operation is very short. This enables the dehumidifier to continue operating at much lower temperatures and this unit is effective right down to 33°F. This is essential for many of the industrial applications of this unit but can also be an advantage in domestic uses, such as in a crawlspace or on a boat. Another feature of this unit is an adjustable humidistat. A humidistat performs a similar function to a thermostat. It detects the level of relative humidity and controls it to the level pre-set with the humidistat. This saves energy as the dehumidifier does not run continuously but cycles on and off to maintain the desired level. This feature is essential for use in remote or inaccessible locations whether in an industrial setting or at home. The Ebac CD30 dehumidifier is bucket-less and the condensate is discharged by means of a gravity fed continuous drainage system. A hose attached to an outlet port in the unit takes the water to a floor level drain or other outlet so the dehumidifier does not need the user to visit it at intervals to empty a water container. If the nearest drain is at a higher level than the location of the dehumidifier a separate condensate pump will be required to force the water up to that level. The main disadvantage of this dehumidifier, particularly for the home user, is its cost. Compared with a room dehumidifier this is an expensive item. What it offers in return is a higher quality build, greater reliability, low maintenance, suitability for use in remote or inaccessible locations and low temperature operating abilities that are difficult to beat.